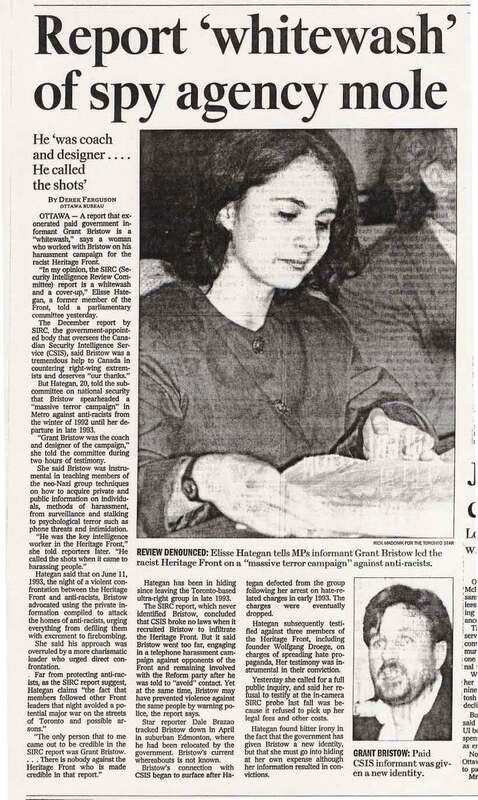 The following clippings, photos and links are only a small assortment of the journalistic coverage Elisa has received over the last 20+ years. Spread across the years, they depict the harrowing journey of a teenage girl recruited by Canada's most powerful white supremacist group and groomed to become the new face of the movement. Her eventual defection from the group and court testimony against neo-Nazis, as well as her discovery of her Jewish roots and conversion to Judaism, has inspired audiences across North America. Many of the events recorded in these news clips were captured in the 1998 CBC film White Lies, an unauthorized retelling of Elisa's story that starred Sarah Polley as a young Elisa Hategan. This collection of press links, footage and clippings is being compiled in order to create an accurate historical archive that preserves the events of the 1990s, as well as sets the record straight about crimes within the Heritage Front. This evidence is also intended to clear up the confusion caused by a disturbed former Heritage Front member who fraudulently appropriated several of Elisa's experiences and attempted to pass them off as her own. Please scroll down to see a list of newspaper/magazine coverage. CityNews Toronto, 680 News. "Former Neo-Nazi Speaks Out Against White Supremacy". April 8, 2019. Rogers Media. The Big Story Podcast. "Can You Deprogram a Racist? How?" November 16, 2018. CHQR 770 Global News Radio, Interview on The Danielle Smith Show. November 6, 2018. Hategan, Elisa. "Online Hate is an Infectious Virus - and it should be addressed like real-life violence." Macleans Magazine, Nov. 1, 2018. Lungen, Paul. "The Many Unexpected Secrets in our DNA", Canadian Jewish News, August 1-7, 2018. Milton, Jon. "Police, Spies and White Supremacy: A Brief History." Ricochet Media, July 25, 2018. Holt, Jared, Far Right Watch. "Episode 20: From Facebook with Love," Sh!tpost Podcast, July 17, 2018. Canadaland, "Canadian History X", Canadaland Commons, April 9, 2018. McCaig, Amy, "Rice to Host March 28 Talk on Combatting White Supremacy." Rice News and Media, March 27, 2018. BBC Three, Interview about young women being radicalized in North America, documentary in production. August 25, 2017. 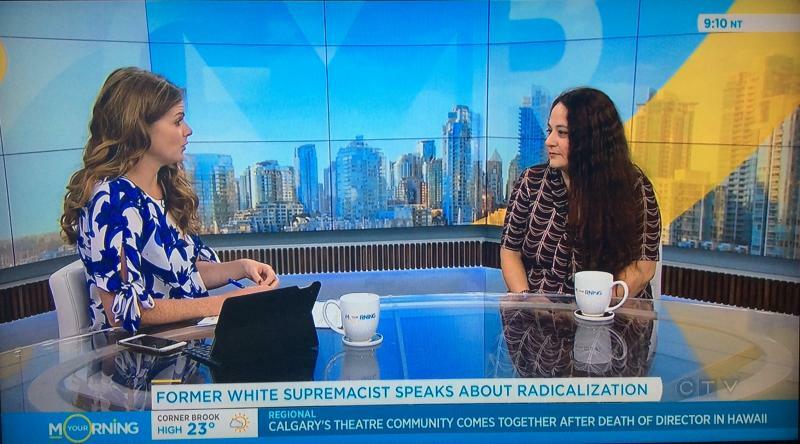 CTV News Staff, "Canadian Former White Supremacist Shares Story." CTVNews.ca, Monday August 21, 2017. 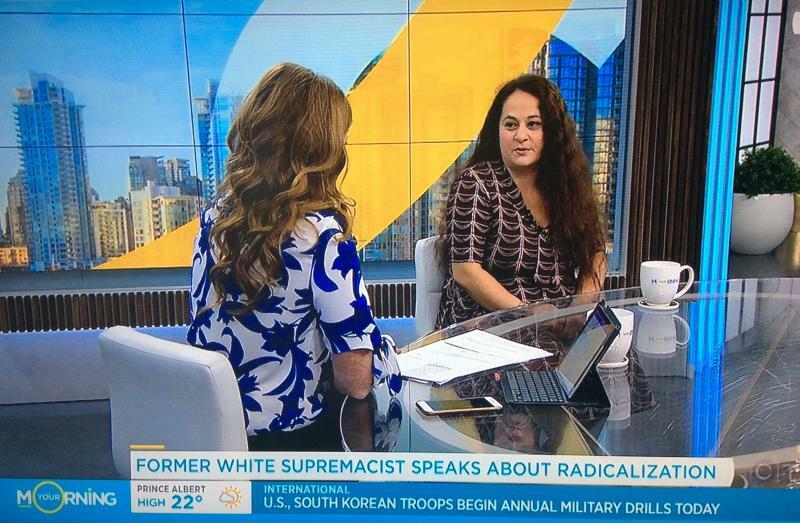 CTV News, "Former White Supremacist Speaks About Radicalization". Your Morning Show, CTV Network, August 21, 2017. CFRA 580 Ottawa, "The Evan Solomon Show" August 23, 2017. CKNW AM980 Vancouver. "Former White Supremacist Speaks Out Against Hate". The John McComb Show, August 18, 2017. CBC News - Interview with Dwight Drummond, August 16, 2017. Frazer, Laura. "A Former White Supremacist Explains How Radicals Recruit and Who They Target." CBC News, August 17, 2017. Popovic, Alexandre. "Produire la menace: Agents provocateurs au service de l'État Canadien﻿". Sabotart Press, 2017. The Montel Williams Show, Season 2, Episode 62: "I'm a Racist".﻿﻿﻿﻿ Nov 3, 1992. Hategan appeared on Montel along with White Aryan Resistance leader John Metzger. Represented the new, young female face of Canada's Heritage Front. 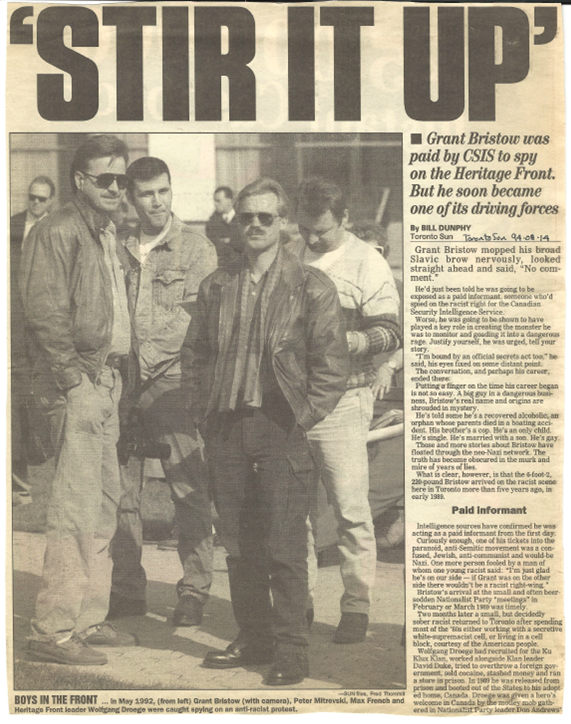 CBC, The Fifth Estate, October 4, 1994.﻿﻿ "Grant Bristow, CSIS and the Heritage Front: Good for Business". CTV National News, with Sandy Renaldo. 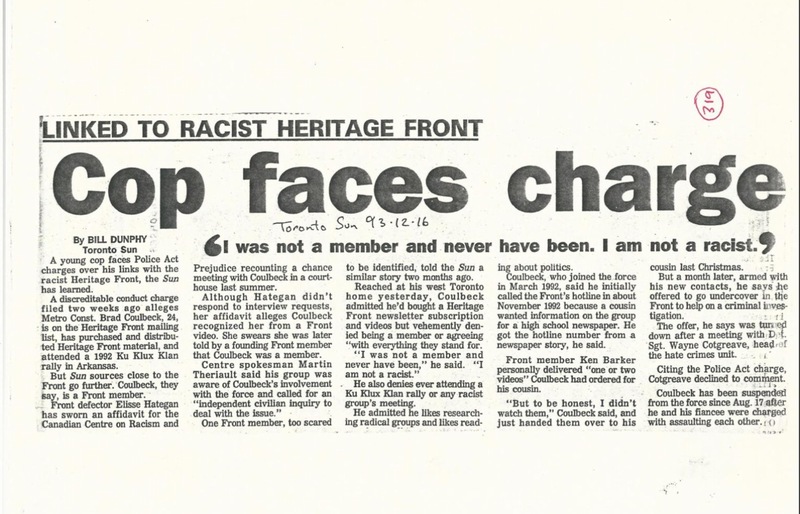 Lead story: Elisse's Defection from the Heritage Front. December 12, 1993. CTV National - dozens of footage clips across 1993-1995, including a 3-part series that aired on CTV National News in 1994. CTV Toronto, Ottawa, Montreal - assorted interviews and footage clips between 1993-1995. Shmilowitz, Tzipi. "אנחנו זוכרים שהיינו נאצים﻿ - We Remember That We Were Nazis." Yediot Ahronot, Israel's largest daily newspaper, special Shabbat supplement edition commemorating Holocaust Remembrance Day. January 24, 2019. CPRLV, ISDGlobal. Comic Book Publication "Radicalshow 3: They are Among Us." November 13, 2018. To be distributed to youth and schools across Canada. Elisa's story is fictionalized in main character Jessica. McCaig, Amy. "Rice to Host March 28 Event Talk on Combating White Supremacy." Rice University News & Media, March 27, 2018. Hayden, Michael Edison, "Neo-Nazi Charged with Domestic Violence Highlights Mistreatment of Women in the Alt-Right." Newsweek Magazine. March 15, 2018. Hayden, Michael Edison, "Neo-Nazi Website Daily Stormer is 'Designed to Target Children' as Young as 11 for Radicalization, Editor Claims." Newsweek Magazine, January 16, 2018. Salles, Alice. "Editor Admits Neo-Nazi Website is Designed to Target Children." January 18, 2018. Hategan, Elisa. "Turned". Lez Spread the Word Magazine (LSTW), Issue 2, December 2017. Bell, Stewart. "Canada's Racist Movement: A History of Violence." Global News, August 20, 2017. Frazer, Laura. "A Former White Supremacist Explains How Radicals Recruit and Who They Target." CBC News, August 17. Hategan, Elisa. "Ernst Zundel: A Life on the Altar of Hate." NOW Magazine, August 12, 2017. Hategan, Elisa. "White Supremacy Sexualized: The Young, Female Faces of Hate." Canadian Jews News, August 15, 2017. Shefa, Sheri. "Controversial Newsletter Continues to be Distributed in GTA." Canadian Jewish News, August 3, 2017. Hategan, Elisa. "Lessons on Hate from a White Supremacist-Turned-Jew" Canadian Jewish News, June 20, 2017. Lungen, Paul. "Indigo Pulls Pro-Hitler and Holocaust-Denial Books from Virtual Shelf." Canadian Jewish News, March 10, 2017. ﻿﻿News Staff, CityNews. "Alleged Toronto neo-Nazi Publication Expands West, Pestering Downtowners﻿." CityTV, March 16, 2016. Mendleson, Rachel. 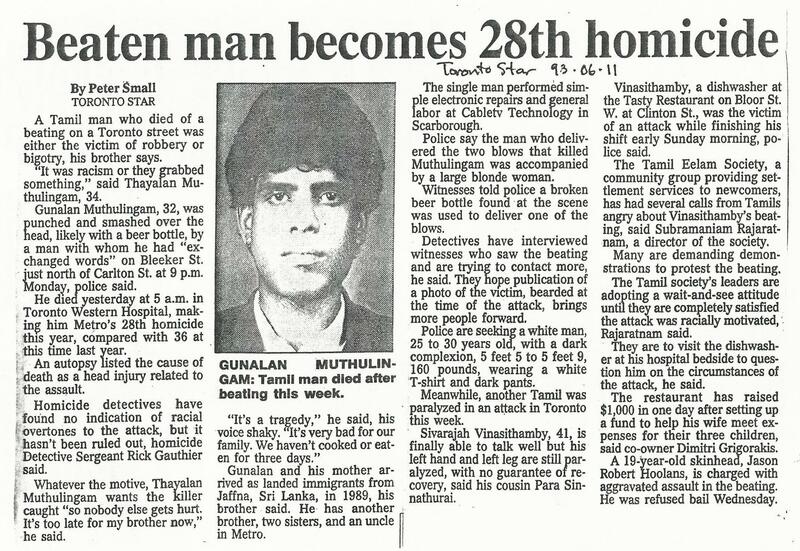 “Former white supremacist probes the personal roots of hatred.”﻿ Toronto Star, May 5, 2015. Mendleson, Rachel. 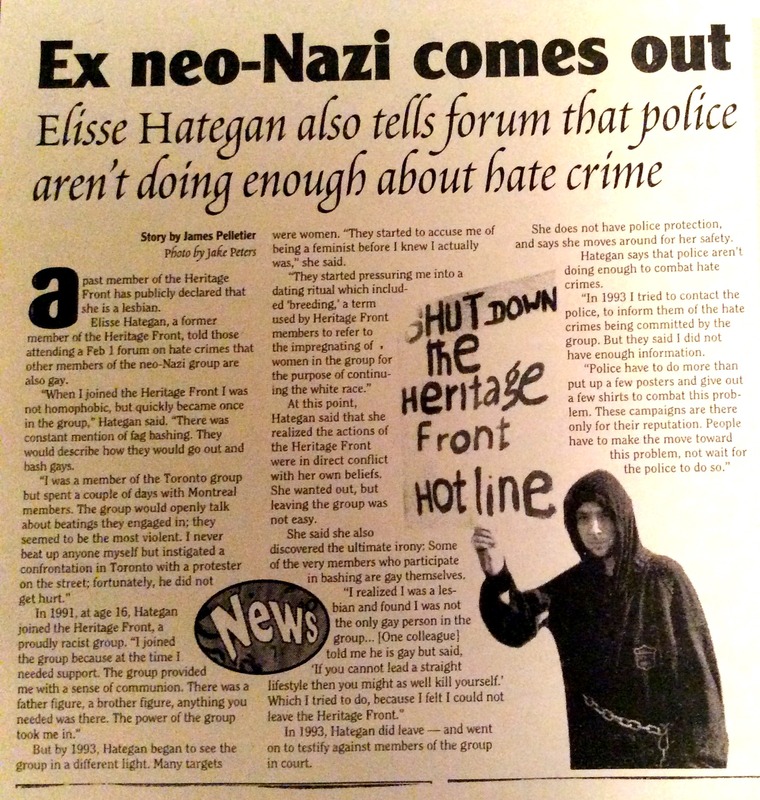 "Timeline: Elisa Hategan's Journey"﻿ Toronto Star, 2015. One People's Project, Idavox. Interview: 'Race Traitor' Author Elisa Hategan. Wednesday, 18 March 2015﻿. Anti-Racist Canada. "A History of Violence, 1989-2011". Incognito Press. 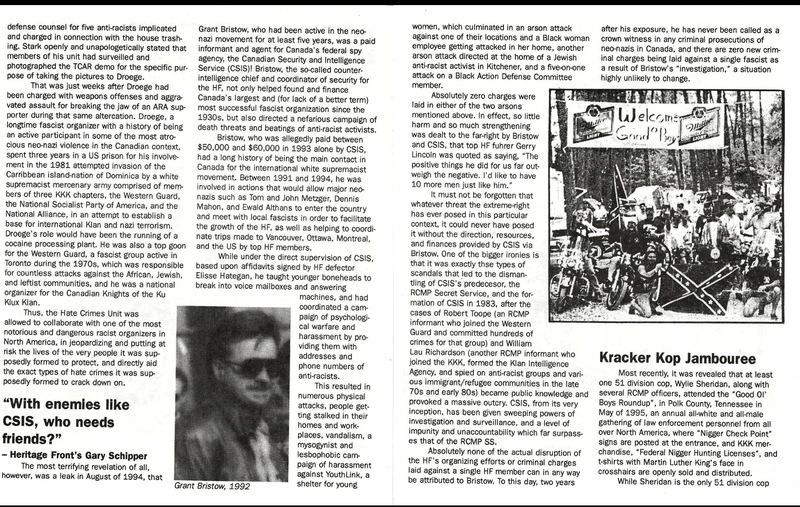 "Old Habits Die Hard﻿: The Dubious Adventures of Grant Bristow, or How CSIS Taught Me Everything I Know About Phone Hacking"
Scholars from the Underground, "Book Review: Race Traitor". April 2014. Sarkar, Samita. "Race Traitor Author Elisa Hategan Talks Gov. Conspiracies, Forgiveness and Her Next Memoir." Blossoms Writing, Nov. 2016. ﻿Sarkar, Samita. "Self-Publishing: An Insult to the Written Word or a Boon to the Industry?﻿" Huffington Post, January 3, 2017. The Globe and Mail, "Hotlines to Homelands: A Trip Through the Far Right." The Globe and Mail, February 8, 1993. Adams, Paul and Edwards, Simon. "Protesters Confront Racists Head-On". Eye Magazine, January 27, 1993. On the Prowl. "Anti-Racist Action Developing Anti-Fascist Strategies in Toronto." Page 1. Page 2. On the Prowl Magazine, Fall 1993. ﻿On the Prowl Magazine. "Blue by Day, White by Night." Page 1. Page 2. 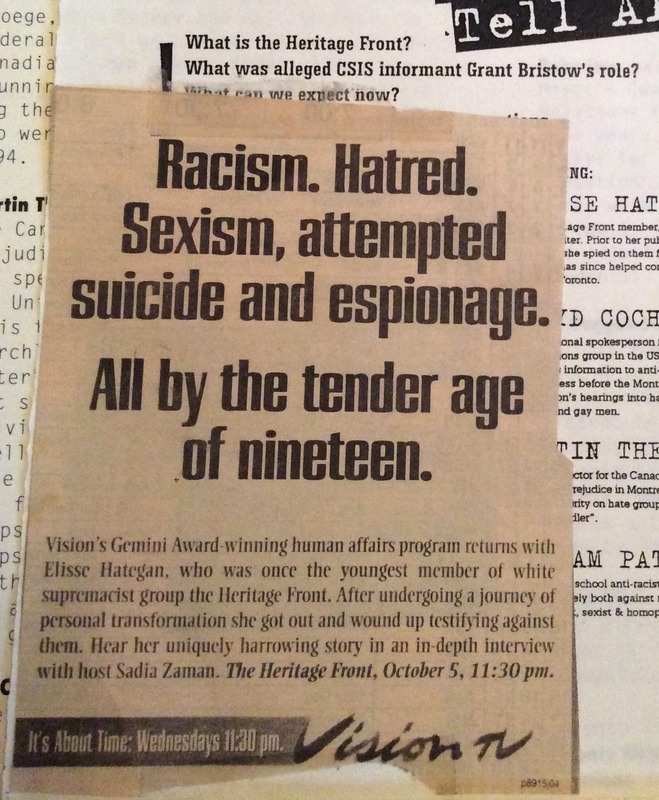 Anti-Racist Action, On the Prowl Magazine, Spring 1994. Small, Peter. "Charges Laid after Leaflets Called Racist Distributed." 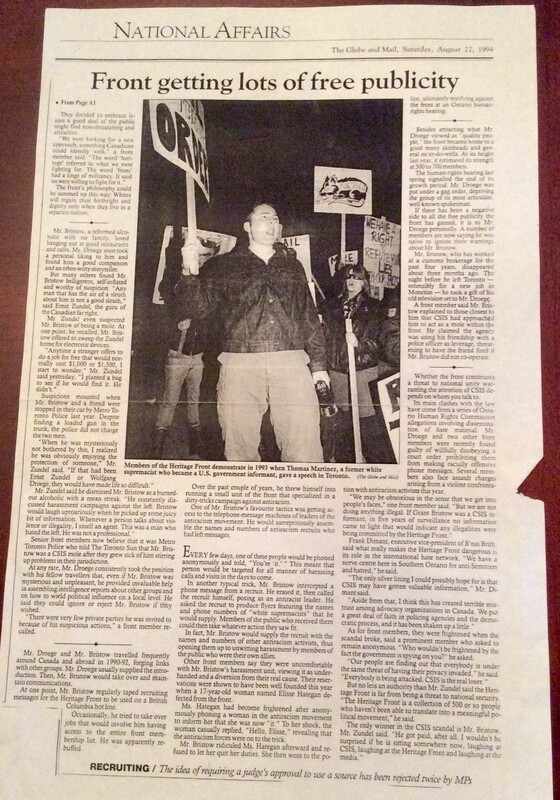 Toronto Star, February 1993. Dunphy, Bill. "Hate Group Teen Boss Out on Bail." February 1993. Dunphy, Bill. "Racist to Fight Hate Charge." Toronto Sun, Aug. 12, 1993. Canadian Press. "Racists Burned House, Defector Says." Kitchener-Waterloo Record, December 13, 1993. Canadian Press. "Racists Bombed House, She Says," Toronto Sun, December 13, 1994. Hamilton Spectator. "Heritage Front Set Blazes, Ex-Member Says." Dec 94. Dunphy, Bill. "Terrorism Forces Two Closures." Toronto Sun, April 1, 1993. Mascoll, Philip. "Public Mischief Charge Dropped." Toronto Star, March 8, 1994. About Black group home counsellor sexually assaulted by HF/ It Campaign. DiManno, Rosie. 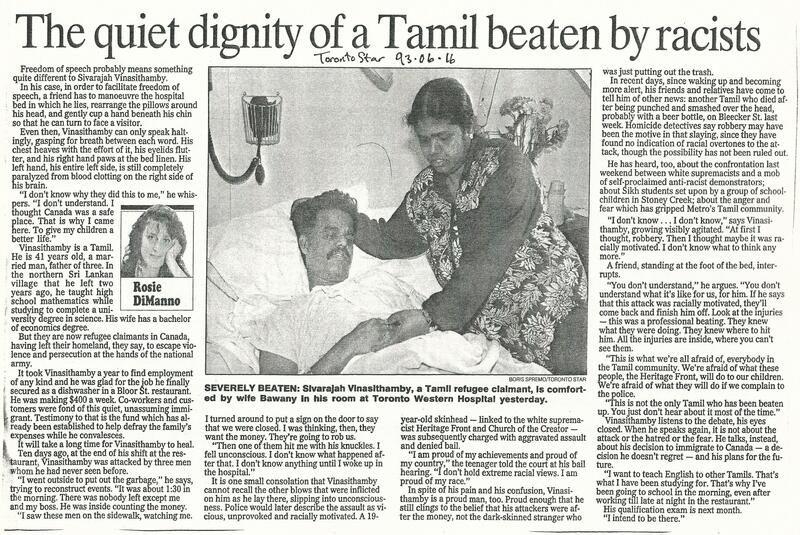 "The Quiet Dignity of a Tamil Beaten by Racists." Toronto Star, June 16, 1993. Dunphy, Bill and Hann, David. "Dad of 3 in Coma: Racially-Motivated Attack." Toronto Sun, June 10, 1993. O'Neill, Dottie. 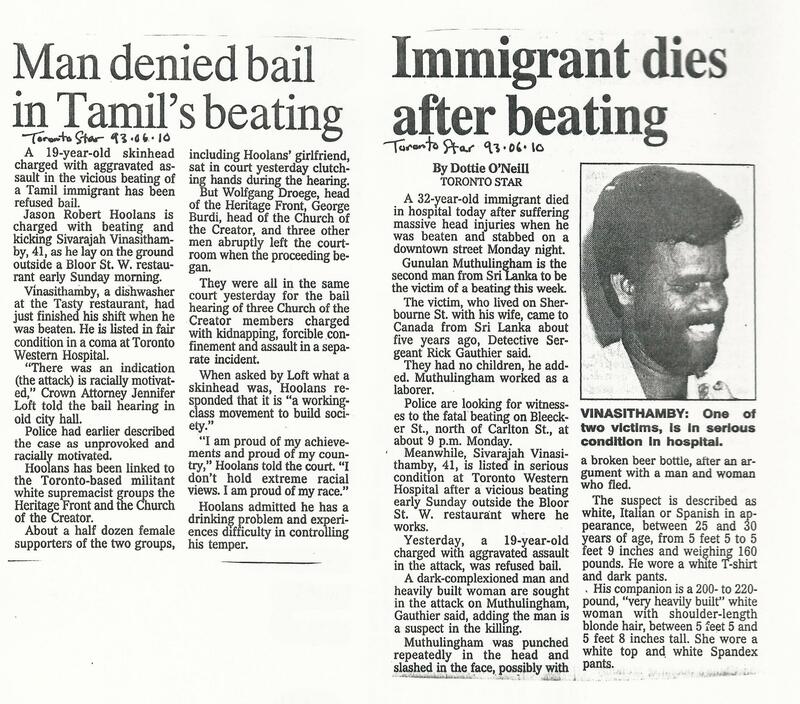 "Immigrant Dies After Beating." Toronto Star, June 10, 1993. Dunphy, Bill. 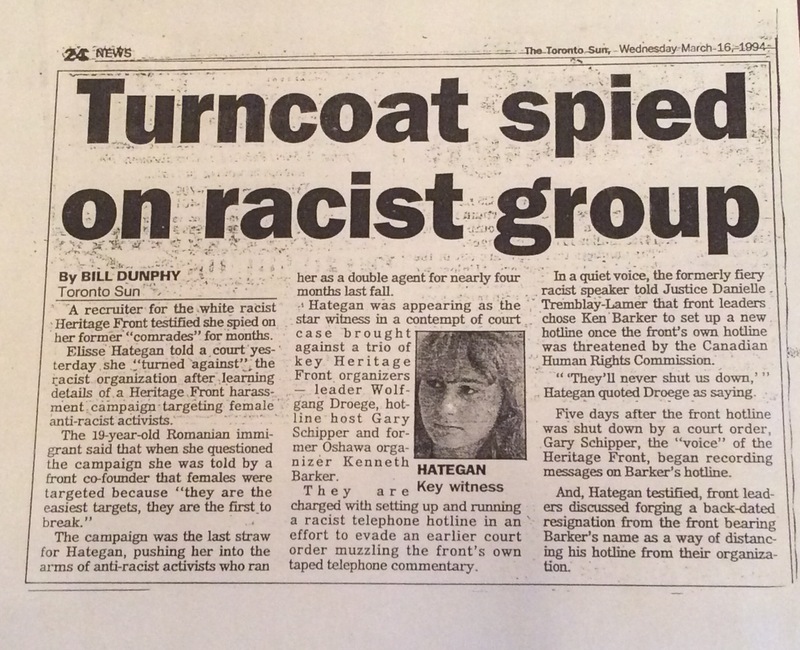 "Turncoat Spied on Racist Group," Toronto Sun, 16 Mar 1994. "Teen Girl Desperate to Escape Racist Group." Hamilton Spectator, March 17, 1994. "Heritage Front Recruiter Says She Wanted to Kill Herself." Kitchener-Waterloo Record, March 17, 1994. Platiel, Rudy. "Front Lawyers Seeking to Testify at Hearing." Globe and Mail, March 19, 1994. Dunphy, Bill. "Some Time Spent with Hatred: She was a Rising Star in the Racist Heritage Front." March 19, 1994. Ruby, Clayton. "SIRC's Intolerable 'Limit of the Tolerable'." Toronto Star, December 21, 1994. Dunphy, Bill. "Cop Faces Charge." Toronto Sun, December 16, 1993. Winsor, Hugh. 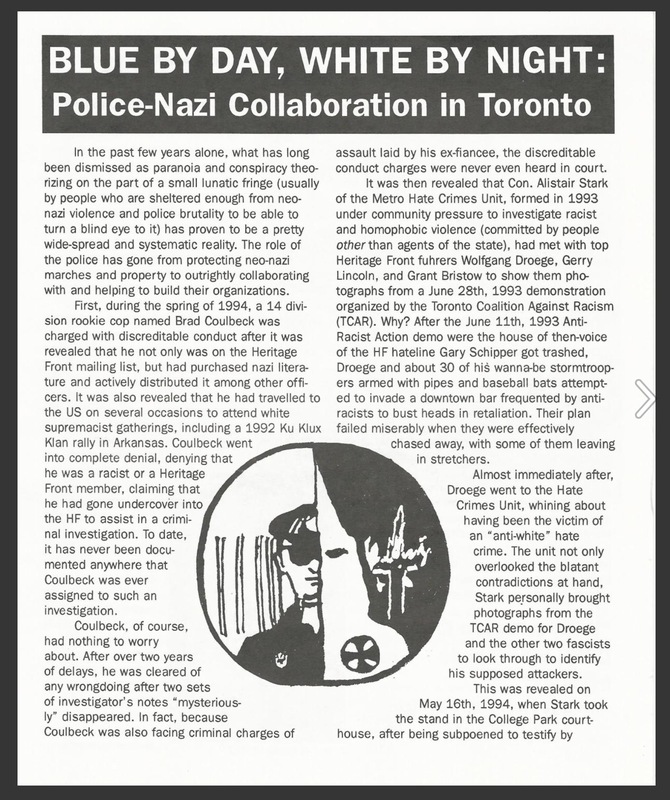 "Toronto Police Officer Linked to Neo-Nazis," Globe and Mail, June 14, 1995. Platiel, Rudy. 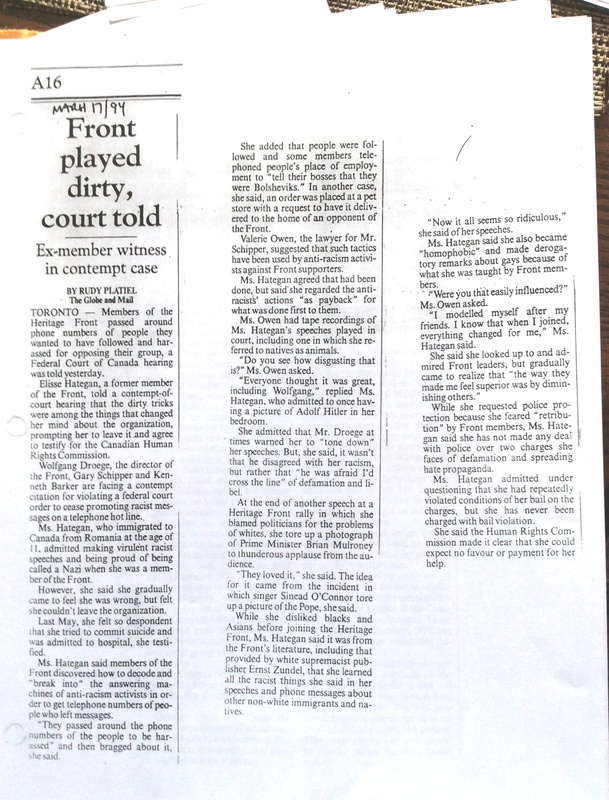 "Front Played Dirty, Court Told." Globe and Mail, 17 March 1994. Platiel, Rudy. 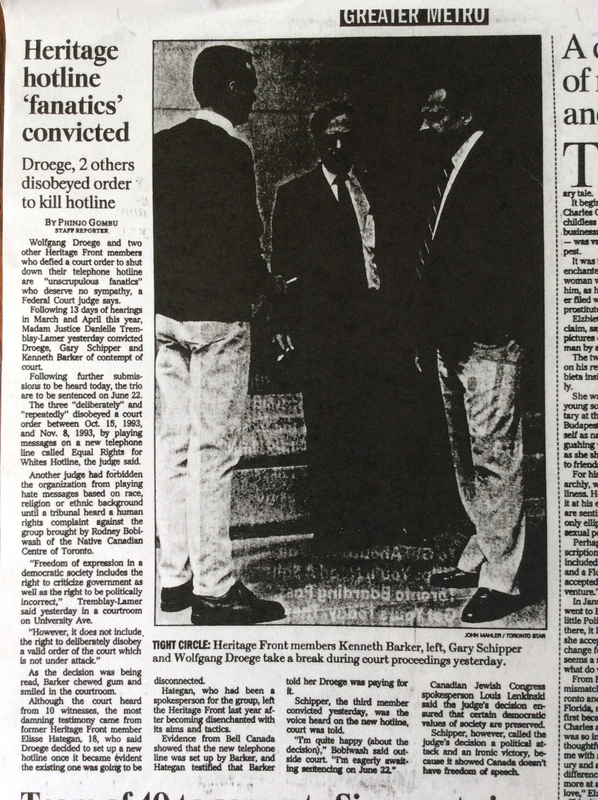 "Front Tried to Thwart Agency, Court Told," Globe and Mail, 16 March 1994. Platiel, Rudy. "Commission to Oppose Testimony." Globe and Mail, March 22, 1994. Pazzano, Sam. "Racist Quick Switch Described." Toronto Sun, March 22, 1994. Platiel, Rudy. "Heritage Front Founder Convicted." The Globe and Mail, June 1994. Gombu, Phinjo. "Heritage Hotline 'Fanatics' Convicted." Toronto Star, 1994. Dunphy, Bill. "Guilty of Contempt: Racists Set for Jail Time." Toronto Sun, 1994. "Heritage Front Members Found Guilty of Contempt." Kitchener-Waterloo Record, June 3, 1994. Wilkes, Jim. "Heritage Front leader, Two Members Jailed." Toronto Star, June 23, 1994. Platiel, Rudy. 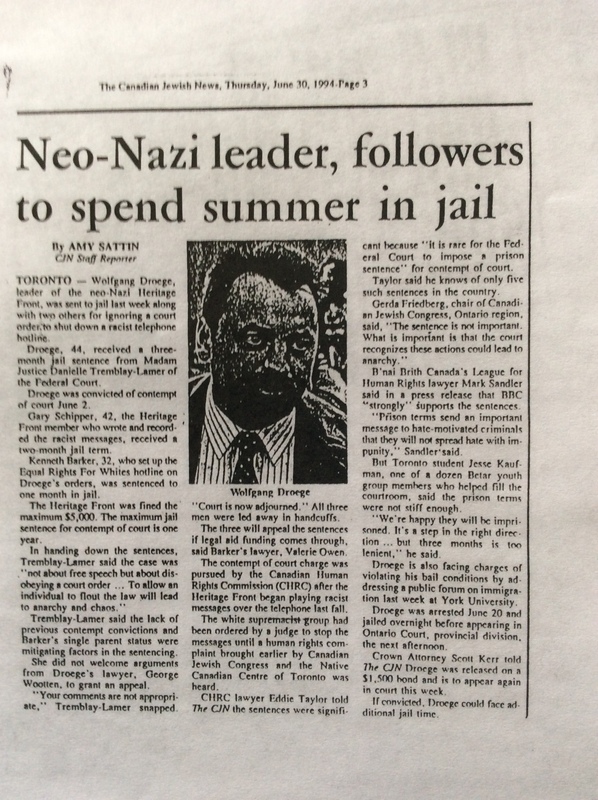 "Three White Supremacists Jailed," The Globe and Mail, June 23, 1994. 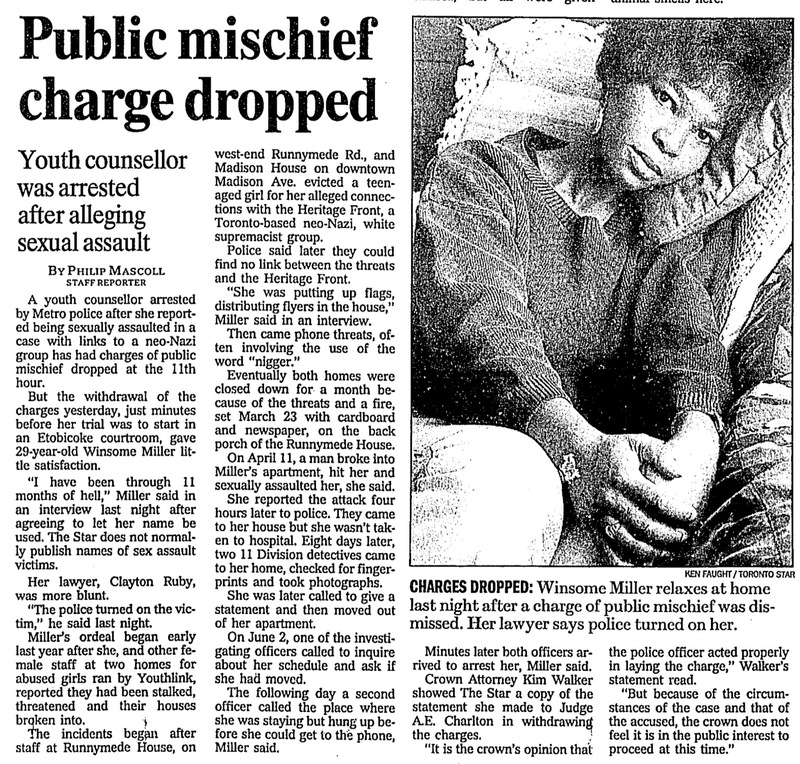 Oakes, Gary "Woman's hate-crime charges withdrawn," Toronto Star, 24 Jun 1994. Dunphy, Bill. "Teen's Hate Charges Dropped." Toronto Sun, June 24, 1994. Globe and Mail. "Crown Withdraws Hatred Charges." June 24, 1994. Sattin, Amy. "Neo-Nazi Leader, Followers to Spend Summer in Jail." Canadian Jewish News, June 30, 1994. Starweek Magazine. "Defector: Vision TV's It's About Time Begins Its Seventh Season with a Dynamite Profile of a Female White Supremacist." Toronto Star, Oct 1, 1994. Makin, Kirk. "Front Enjoying Media Attention." Globe & Mail, August 27, 1994. Cal Millar and Dale Brazao. "Parliament set to probe secret actions of CSIS spy, Committee to see if Grant Bristow was a spy or racist." Toronto Star, September 12, 1994. Winnipeg Free Press. "Hate Groups Splintering: Young Racists Question Leadership." Winnipeg Free Press, October 2, 1994. Cole, Trevor. "The Young and the Racists." 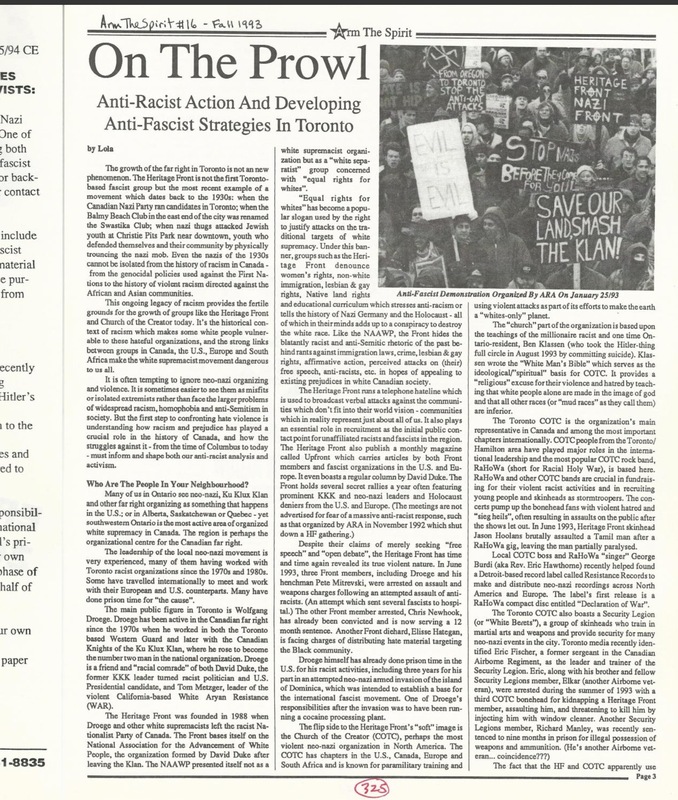 Globe and Mail, Broadcast Week Magazine, February 25 - March 3, 1995. Bickley, Claire. "TV Special Tackles Repugnant but Persistent White Noise." Showbiz Week, Toronto Sun, February 28, 1995. Stevenson, Jane. "CTV Documentary a Chilling Look at Racism Among Youth." Canadian Press, February 25/26, 1995. Malleck, Bonnie. "Hearts of Hate: Documentary Paints Unflattering Picture of Supremacists." Kitchener-Waterloo Record, February 28, 1995. Blakey, Bob. "Hearts of Hate: Documentary Reveals Neo-Nazi Skinheads and their Expanding Web of Hatred." Calgary Herald, February 26, 1995. Dunphy, Bill. "CSIS Mole Fuelled Hate." Toronto Sun, June 1995. The Canadian press. "Heritage Front Defector Accuses CSIS of Coverup." Ottawa Citizen, June 14, 1995. The Hamilton Spectator. 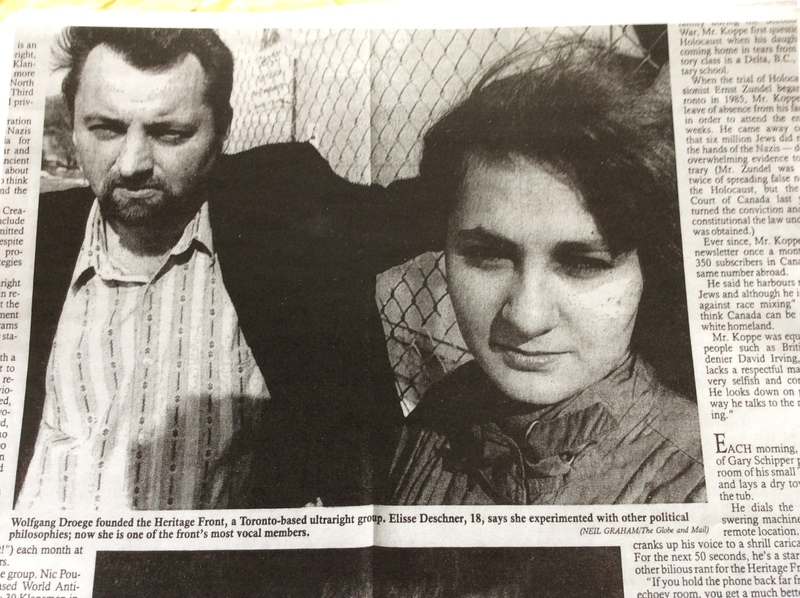 "Ottawa Report on Spy in White-Power Group a Coverup: Defector." The Hamilton Spectator, June 14, 1995. Winnipeg Free Press. "CSIS Report a Coverup: Defector." June 14, 1995. Toronto Star, September 10, 1994. "Exclusive: CSIS spy snapped in Libya: Portrait of the vanishing spy: Grant Bristow was a man with great contacts and plenty of money to spend." Ruby, Clayton. "SIRC's Intolerable 'Limit of the Tolerable'." Toronto Star, 1995. Dale Brazao, “Star finds Grant Bristow”, Toronto Star, Apr 20, 1995. Gamble, David. 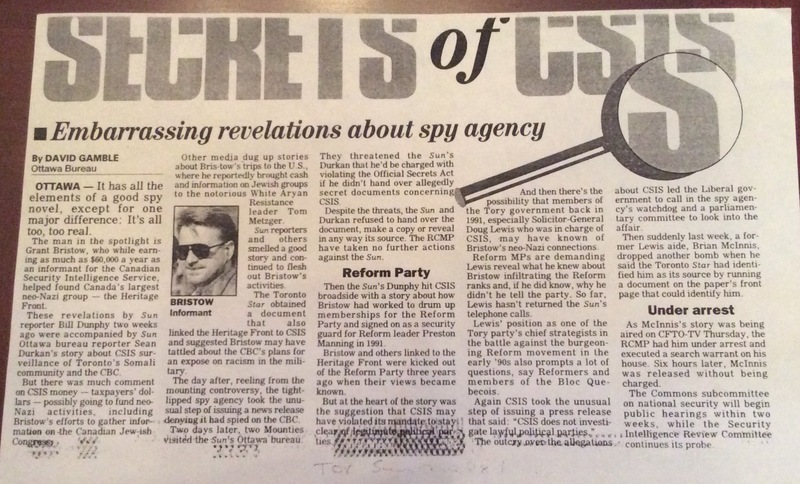 "Secrets of CSIS - Embarassing Revelations About Spy Agency." Toronto Sun, August 28, 1994. Vienneau, David, Speirs, Rosemary and McCarthy, Shawn. "Ex-Aide Admits Leaking Spy Note." Toronto Star, August 26, 1994. Vienneau, David and Speirs, Rosemary. "Leak Furor Clouds the Issue, MP Says: Link Between CSIS, Racists the Key Question." Toronto Star, August 27, 1994. Makin, Kirk. "Whistle Blower." The Globe and Mail, October 1, 1994. Brazao, Dale. 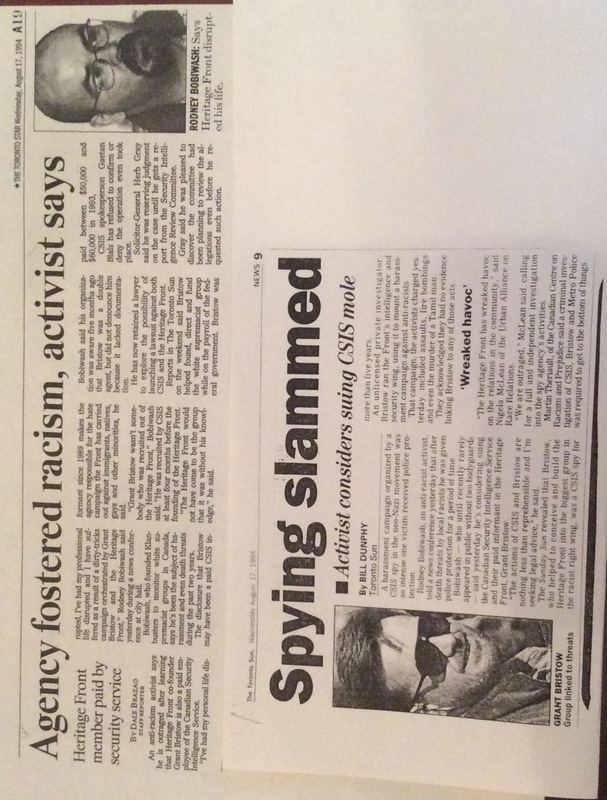 "Agency Fostered Racism, Activist Says." Toronto Star, August 17, 1994. Aboriginal Rights activist Rodney Bobiwash discusses plans to sue CSIS and Grant Bristow for harassment and instigating terror campaign. Hategan, Elisa. "Race Traitor: The True Story of Canadian Intelligence's Greatest Cover-Up." Incognito Press, 2014. Please note: this is a growing list, with new articles and links to archival material being added weekly. 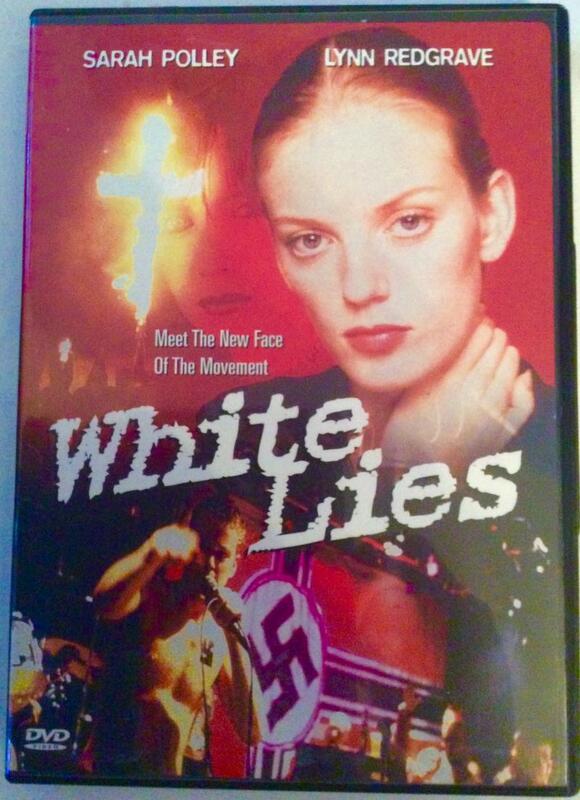 CBC's 1994 film White Lies depicts Elisa Hategan's teenage years.